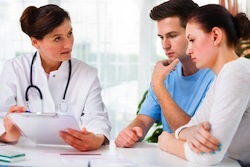 Multiple fertility treatments are available for women facing infertility. Finding the right treatment reduces the overall cost and improve outcome. Clinical studies aim to aid fertility doctors in choosing the right treatment for select groups of women. Researchers from Clamart, France recently published an observational study into the effectiveness of IVF-ET on a poor response group. Poor response criteria included maternal age (in excess of 38 years), antral follicle count less than 10 on cycle day three and lower than normal FSH and AMH levels on day three. About 38% of women in the poor prognosis group cancelled scheduled IVF-ET due to poor prognosis and only 22% who did not cancel eventually conceived. The control group cancelled only 13% of the time and treatment resulted in live birth in 35% of controls. Conclusion: Due to the high cancellation numbers, fertility specialists may want to consider alternative fertility treatments for women in the poor prognosis group. Source: Lamazou F, Fuchs F, Grynberg M, Gallot V, Herzog E, Fanchin R, Frydman N, Frydman R. Cancellation of IVF-ET cycles: poor prognosis, poor responder, or variability of the response to controlled ovarian hyperstimulation? An analysis of 142 cancellations. J Gynecol Obstet Biol Reprod (Paris). 2012 Feb;41(1):41-7. Epub 2011 Aug 10.